Meeting in the GlassRoom, Pittencrieff Park, Dunfermline, all YAC members are encouraged to take part. Lunch will be provided each day. As well as support from SUP, we will have Stephen Reid of ImmersiveMinds providing techie know-how. SUP has already helped Abbot House volunteers to make a video about the life of the house as a heritage centre ( http://scotlandsurbanpast.org.uk/project/abbot-house-dunfermline). First we try to work out just what Abbot House might have looked like when it was first built. We’ll be gathering data in the field and using old maps and plans as well as getting stuck-in with Minecraft itself. Recreating Abbot House in Minecraft isn’t just fun, it is useful historical research. 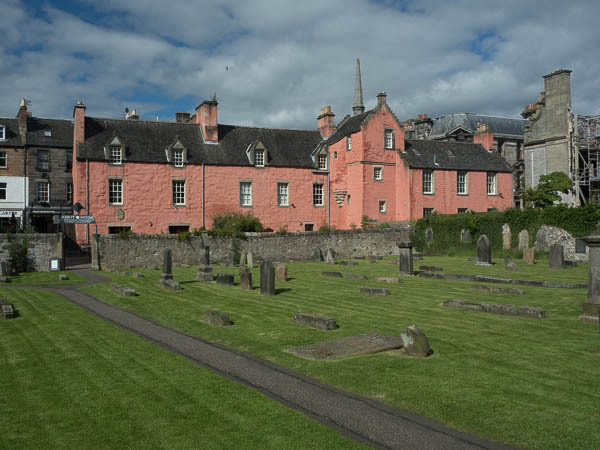 One of our leaders, Naomi, is studying Abbot House as part of her University degree; we will be helping her and other historians and archaeologists to understand Abbot House. 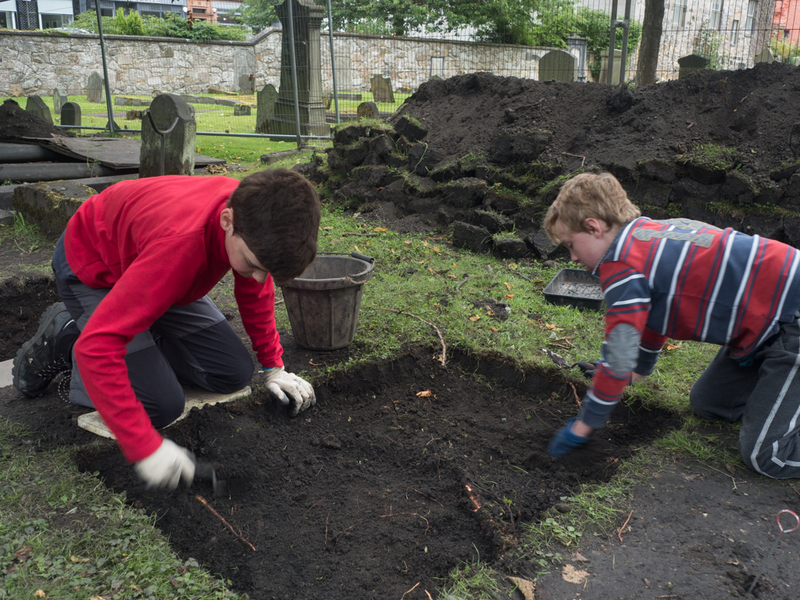 Our project will help YAC members to work for Heritage Hero awards and, maybe, Youth Scotland’s Dynamic Youth awards too. If anyone has any queries about the project and Dunfermline YAC just drop me an email at contact@yac-dunfermline.org. And if you can’t wait till October, head over to the Crafting the Past page on the Digit2017 Web site to download Minecraft realisations of a mansion or a Roman fort or an Iron Age hill fort. 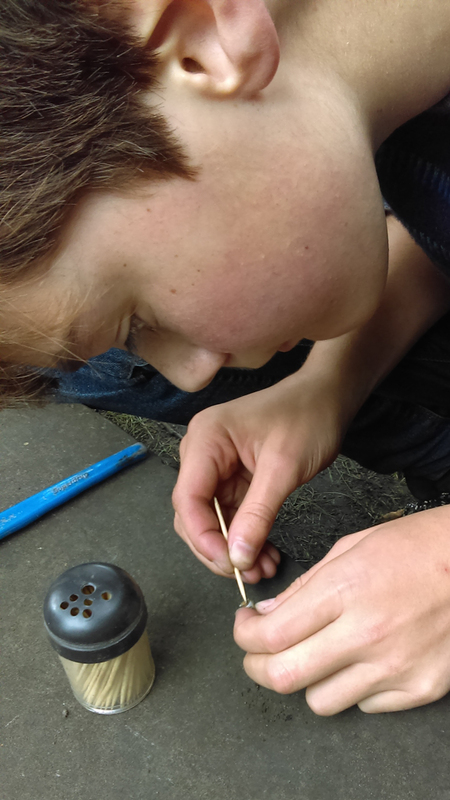 This week I’d like to introduce a blog entry by Alexander, a member who has played a key role in this year’s dig. He has chosen to look more closely at the stray human teeth we have come across during the season. 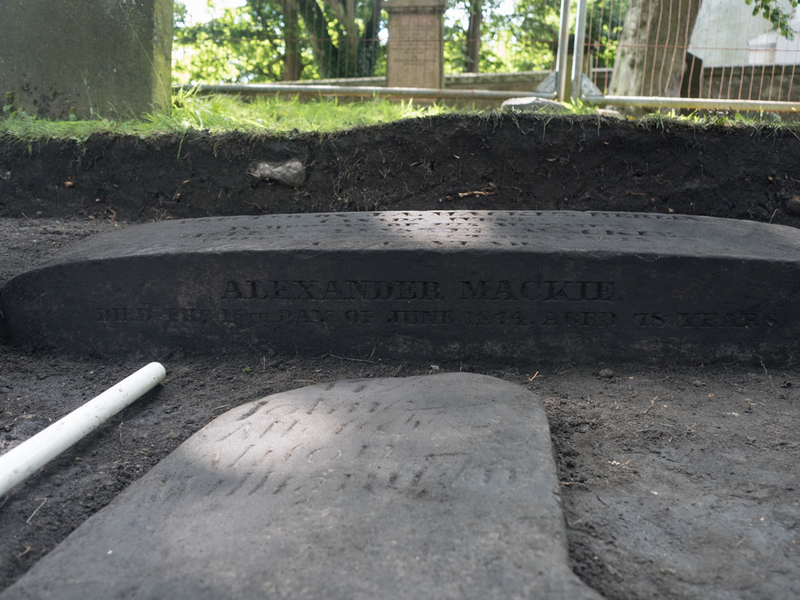 Whilst we treat all human remains with respect, it seems right for Alexander to take the opportunity to tell something of their story before they are interred once more. During our dig, we have found lots of different types of bones. Maybe most surprisingly we have found lots of teeth. We have nineteen individual teeth and one piece of jawbone with two teeth in it. Teeth survive so well in the soil because of the enamel that protects them. Alot of our teeth show signs of wear. This is because the oats and wheat were stone-milled so small bits of stone got into the flour so, anything that was baked using flour wasn’t very good for the peoples teeth. Wear on teeth can tell us a lot about the lifestyle of the person they belonged to, for instance – there are no cavities in the teeth beacuse there was not much sugar in their diets. 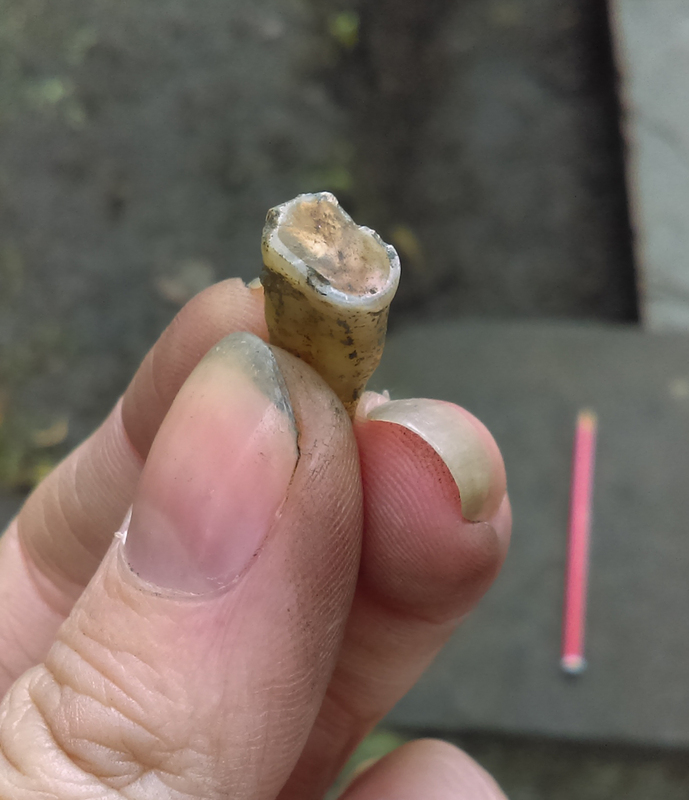 We are also assuming that the teeth we have found are all from the individuals that died in the 19th century or earlier because we know that the graveyard wasn’t used for burials after the end of that century. This worn molar can tell us about the food that this person ate. Poorer people would eat lots of bread and grains such as oats and wheat. A loaf of bread cost three pennies. Poor families could only afford meat or fish once a week. This was usually saved for Sunday lunch. 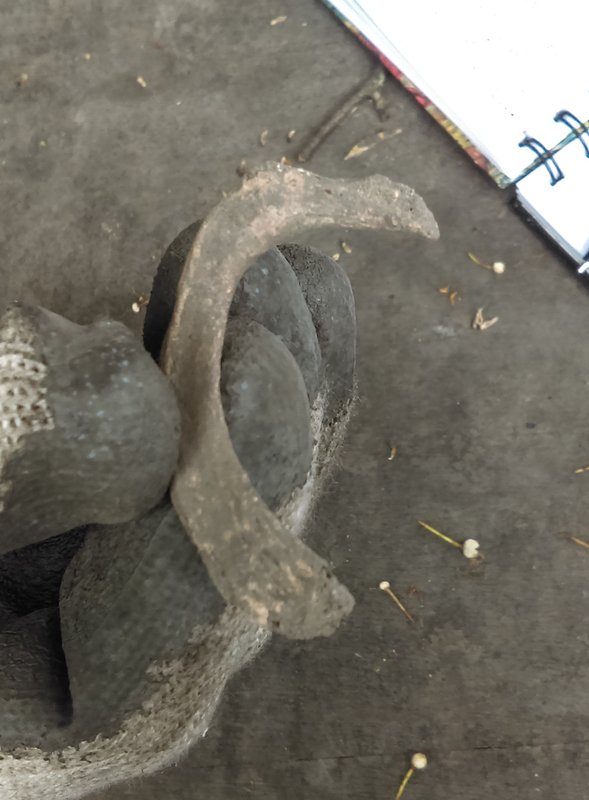 This coarse food would need lots of chewing and that’s how the teeth were worn down. These cheap foods weren’t very high in vitamins and so health problems such as rickets could occur. 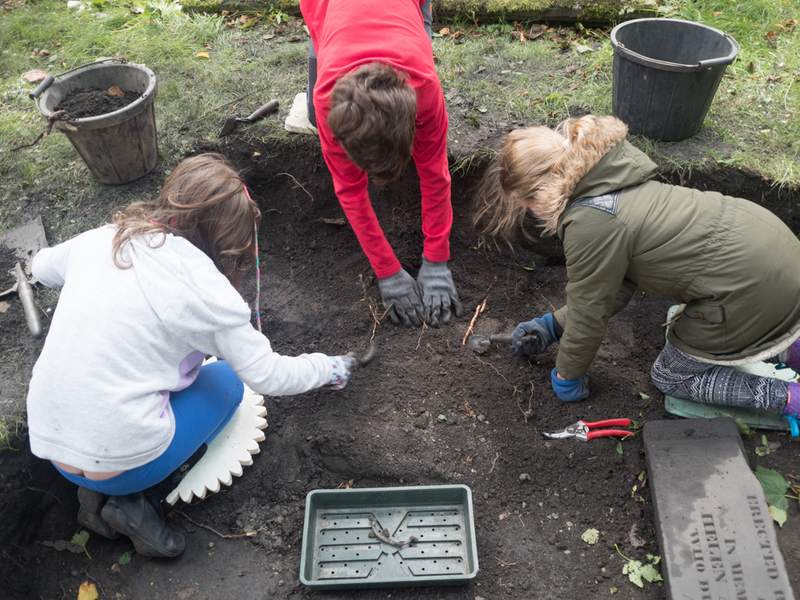 Also on our dig we found lots of small bones that would have have belonged to children. This also suggests that health was an issue and mortality rates were high. The large amount of children’s bones we have found suggests infant mortality was high too. 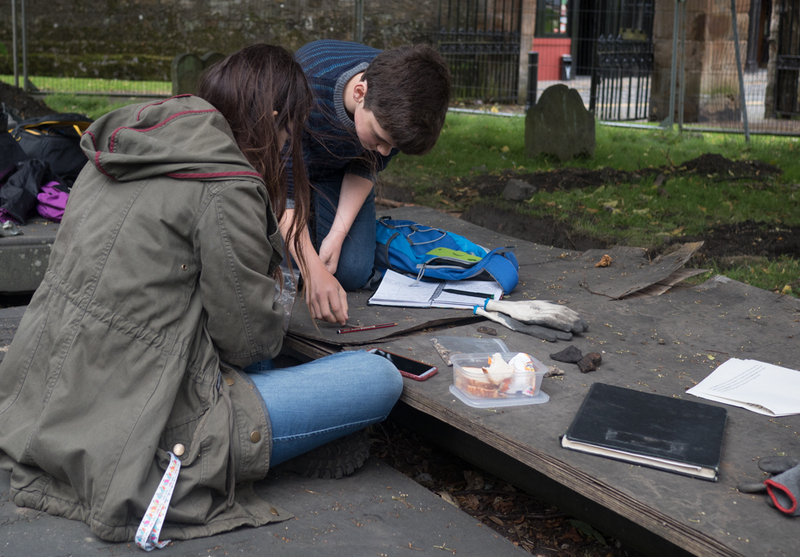 Far from being unlucky, our 13th day working in the Abbey graveyard was amazing. 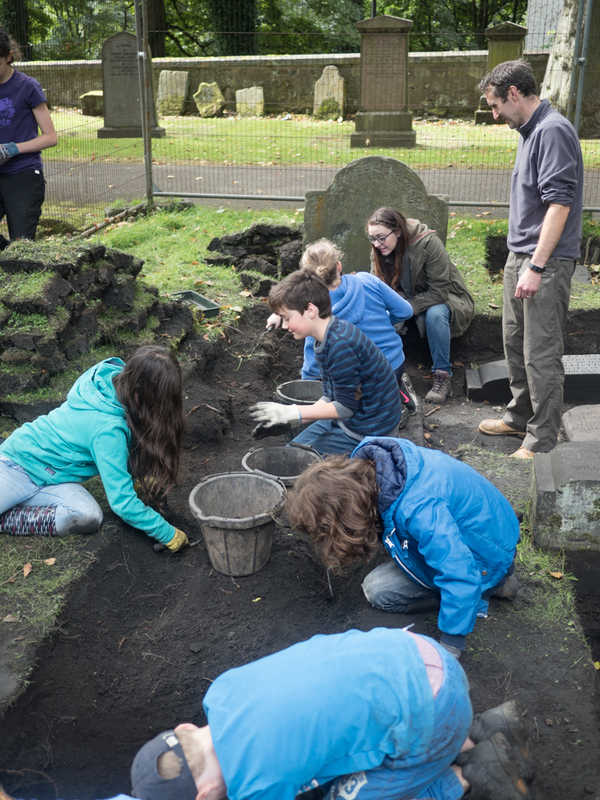 Sue Mowat and Alan Calder from DHCP came along to see how we were doing, while Kate Fowler, who runs the Heritage Hero programme for Archaeology Scotland visited to see what our members get up to. Her feeling was that all the members who have participated in the dig this year will be inline for an award, so there’ll be more news on that front at a later date. We had a steady stream of visitors all day. Dougie seemed to be a permanent fixture at the fence, answering questions. He was told by one gentleman what it mean’t to see young folk doing such an amazing job for the rest of the community and how much he appreciated their hard work. 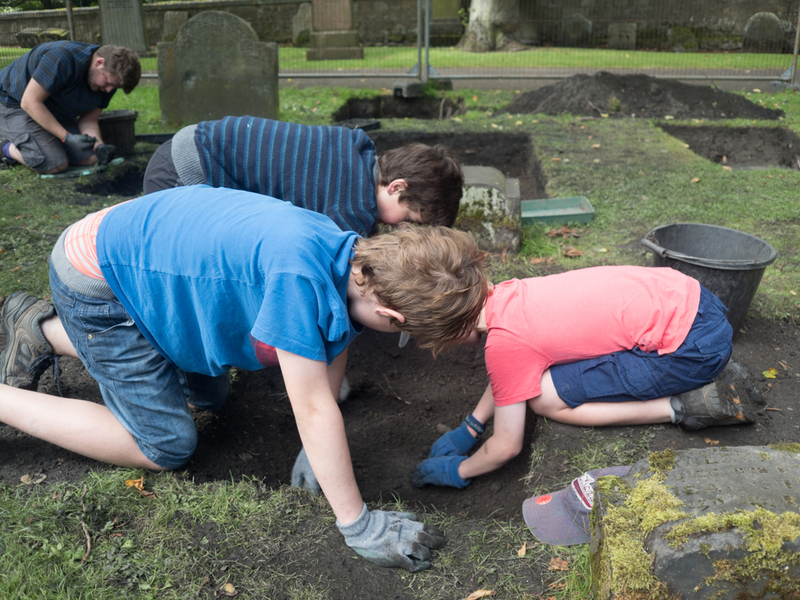 Visitors are constantly amazed at how much the young folk have achieved in the graveyard and are so pleased to see them working alongside DHCP. As well as all the visitors, we had a record number of YAC members on site today. 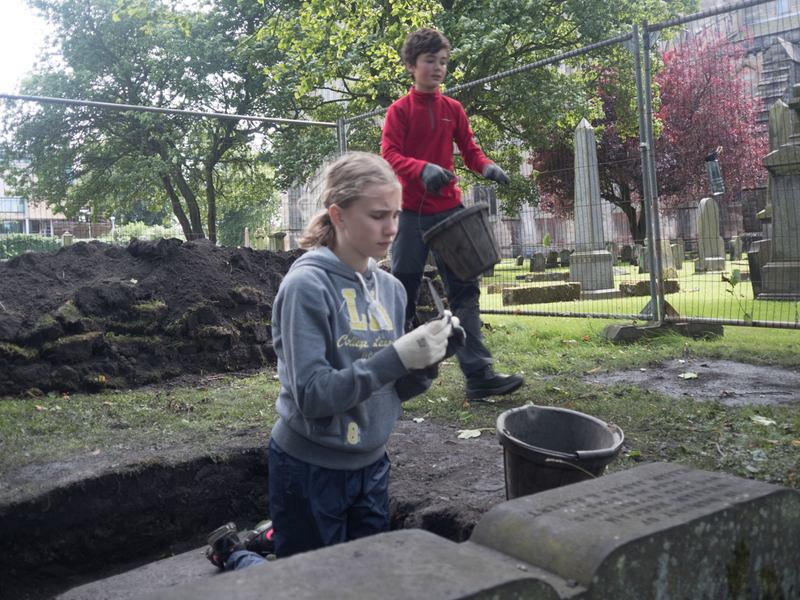 Alexander, Algirdas, Andrew, Daniel, Erin, Kathryn, Katie and Olivia were all busy working away, excavating a test trench, finishing the job of uncovering the table stone we found previously, studying the human remains recovered, dealing with finds and talking to the public. With so many on site we got a huge amount of work done and made some rather cool finds. Well done everyone! 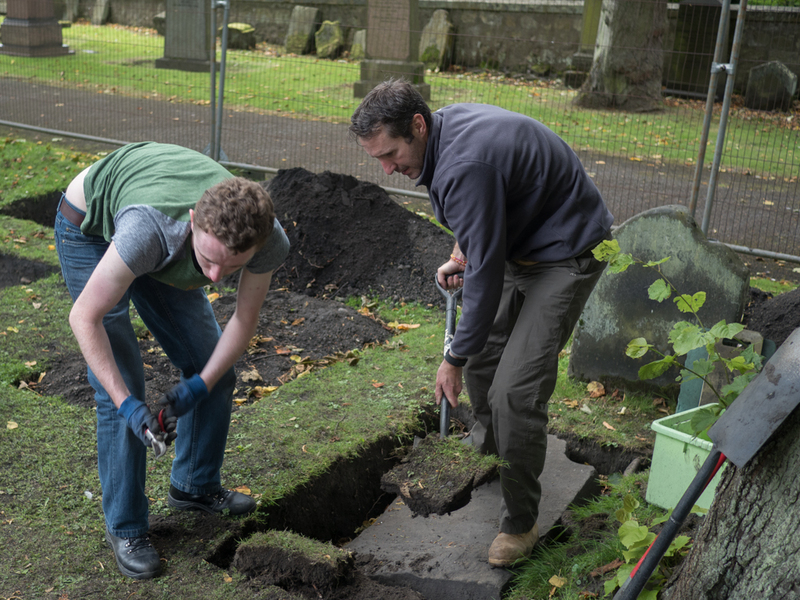 Jean of DHCP had found yet another gravestone last week, so Dougie and Kieron began the fun job of deturfing and excavating to uncover it. So far there is no inscription visible, but we remain hopeful. Uncovering the edge a table stone and enlarging a test trench. 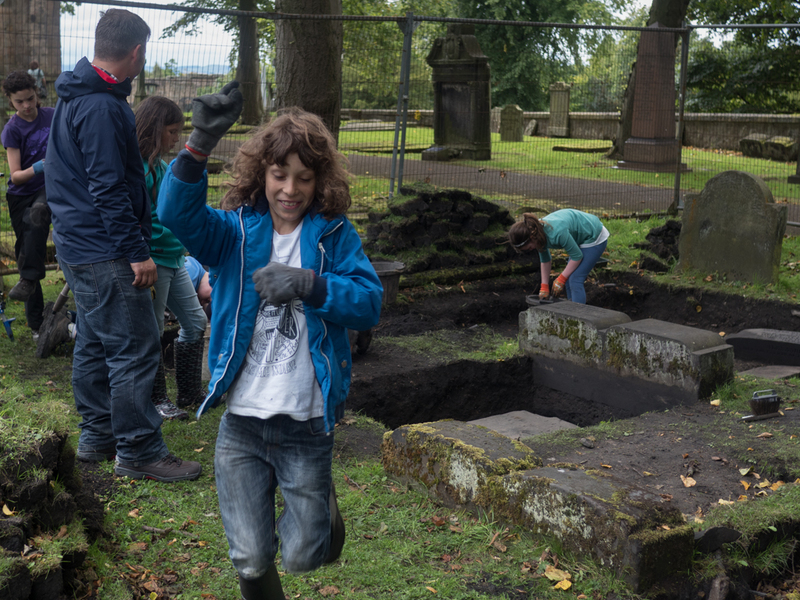 With the schools starting again next week we are cutting back to Sunday afternoon visits to the graveyard. We had a good turnout today with Alexander, Andrew, Daniel and Katy coming along. We were also joined for the first time by our new leader, Charlie. 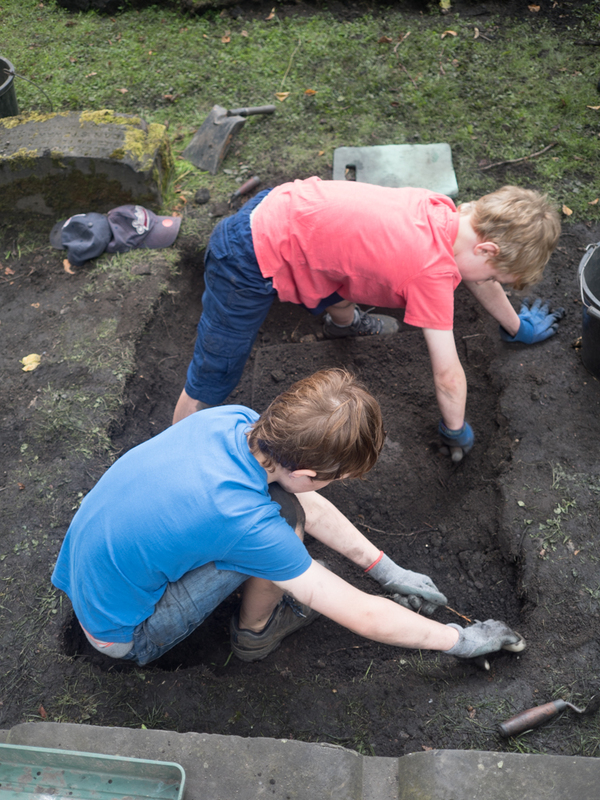 We opened up a new test trench in the south east corner of the excavation site, with Alexander, Daniel and Andrew doing the lion’s share of the work. So far nothing much has come to light and no new gravestones. I suspect we will be backfilling next week, but you never know. 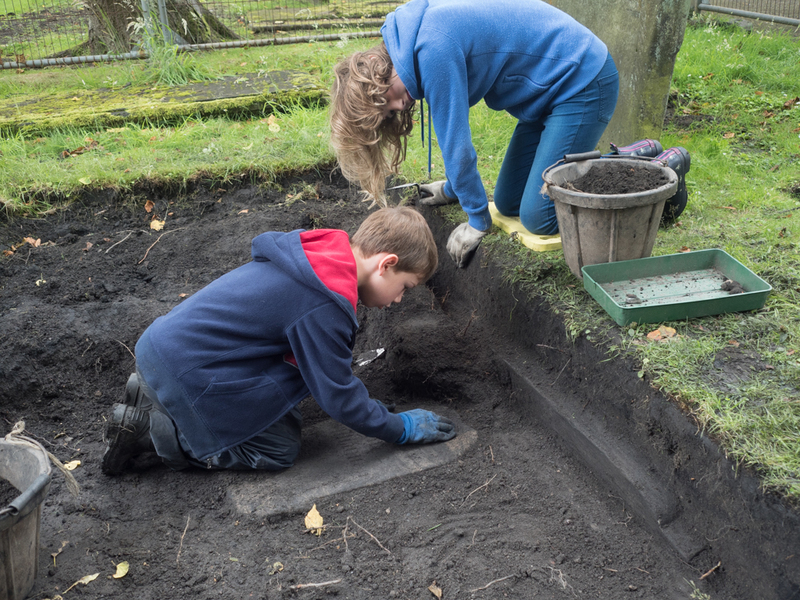 Andrew and Charlotte worked to level the trench immediately to the west, clearing the table stone we found last time. There doesn’t look to be any surviving inscription on what is quite a sizeable monument. Given the amount of grave reuse and the landscaping of the 1920s, we have inevitably come across fragmented skeletal material mixed in the earth as we excavate. 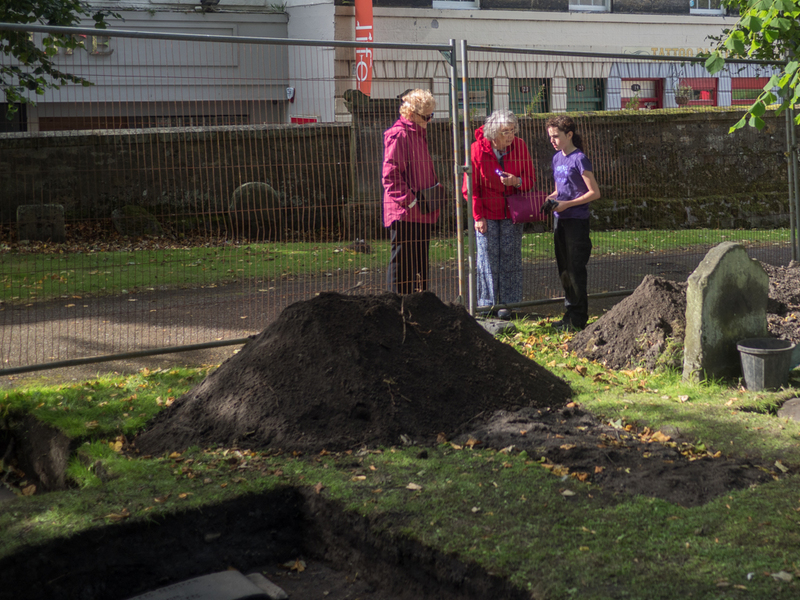 The larger fragments are set aside to be properly reinterred at the end of the season, hopefully showing more respect than was the case in the past. 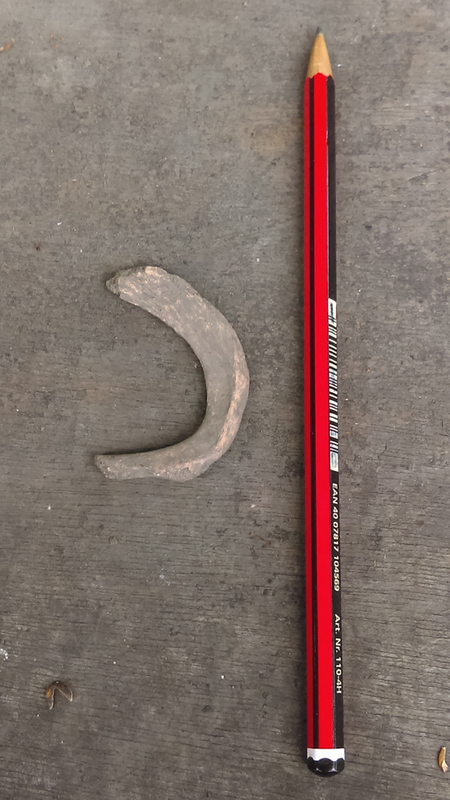 Whilst these remains are temporarily stored on the surface, we have a brief opportunity to study them and learn what we can of the stories they might tell. We took advantage of Charlie’s knowledge of human physiology, gained through academic research and subsequent work, to begin this work. She and Katy spent much of the afternoon sorting and categorising fragments of human remains and making sure they are stored properly. 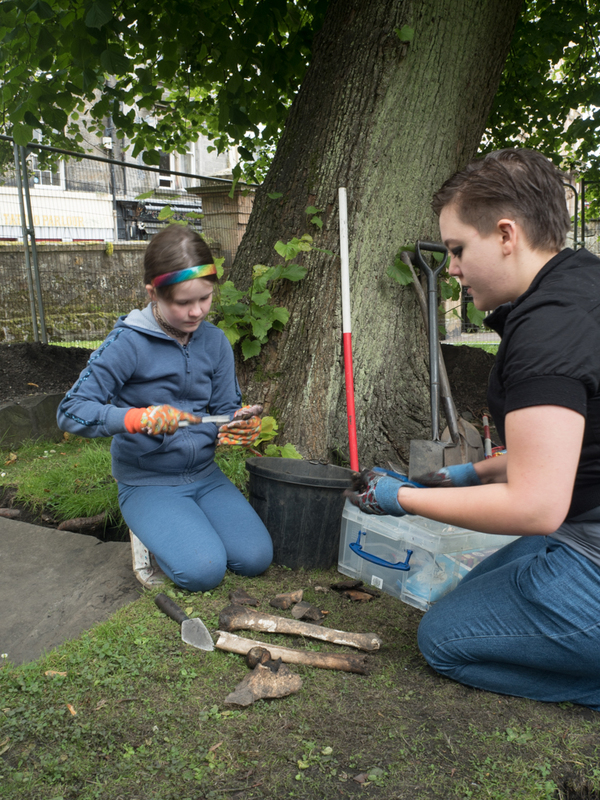 Charlie and Katy examine some of the fragments of human bone we have recovered. I have mentioned before that a lot of passers-by stop and ask us about the work we are doing in the graveyard and today was no exception. Charlotte decided that this was the day when YAC members would shoulder some of the responsibility for public engagement, and so it was that Alexander and Daniel had their first shot. They did a good job too. 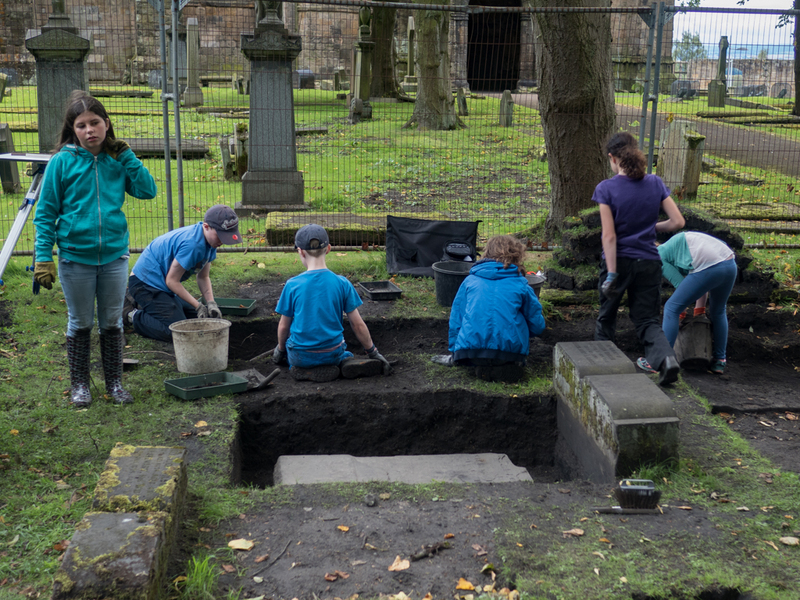 Dunfermline YAC had a busy weekend: two gravestones were discovered, more finds recovered, stones cleaned up, all accompanied by plenty of banter. Over the two days Alexander, Andrew, Daniel, Kathryn, Katy and Mhairi all made contributions to the success of the weekend. Saturday started quietly enough as we worked to level the large trench in which we had already found two stones. 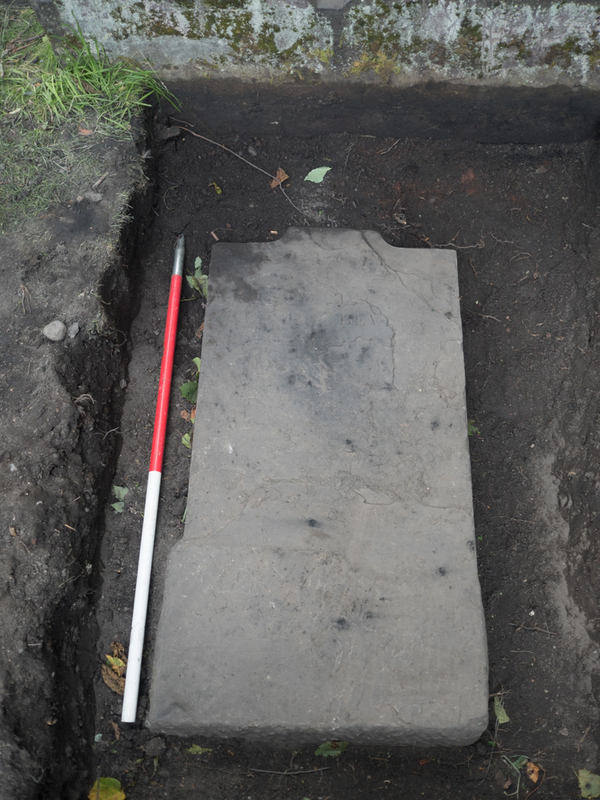 We didn’t turn much up, little realising that a large recumbent stone was just a few cm below our trowels. Then Andrew and Daniel arrived and started working in a small test pit one row to the east of the main effort. The trench had been explored a few days earlier without success and I fully expected to be backfilling it after half an hour. 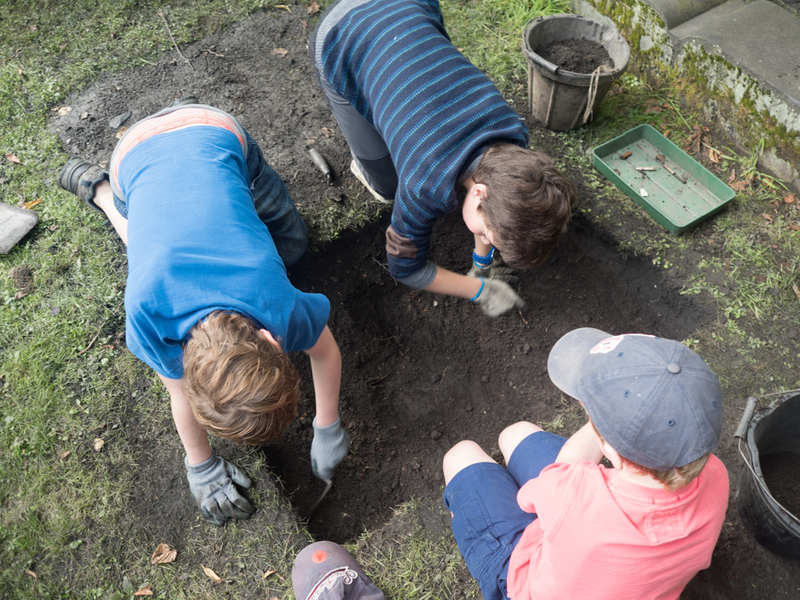 However the newcomers quickly realised that there was a headstone in the trench and, with Alexander’s help, we were soon looking at the base of a headstone. Whether the stone lies where it had originally fallen, or was used as fill in 1927 we don’t yet know. 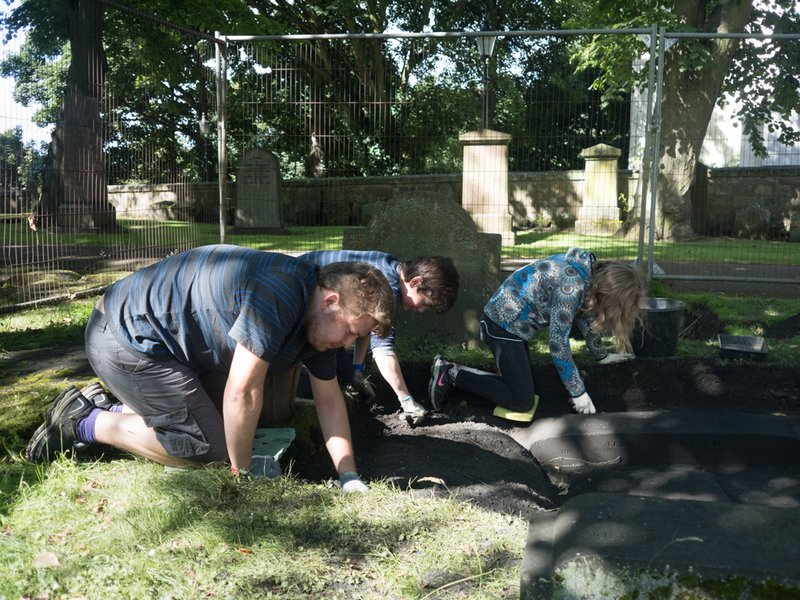 On Sunday Katy, Kathryn and Mhairi took turns to help reveal the top edge of the headstone and to clean up around the sides; a long and sometimes tedious job, but well worth the effort. So much for Saturday. 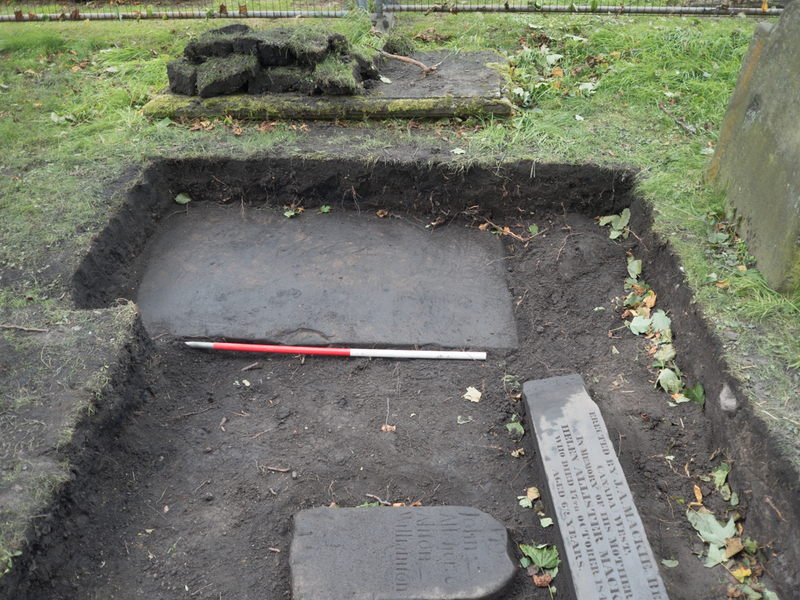 On Sunday focus moved back to levelling the trench immediately to the west. This time the members came quickly onto the gravestone missed the day before. We soon realised that the trench would need to be enlarged to uncover the stone and so much of the rest of the day was spent extending to the south and east. 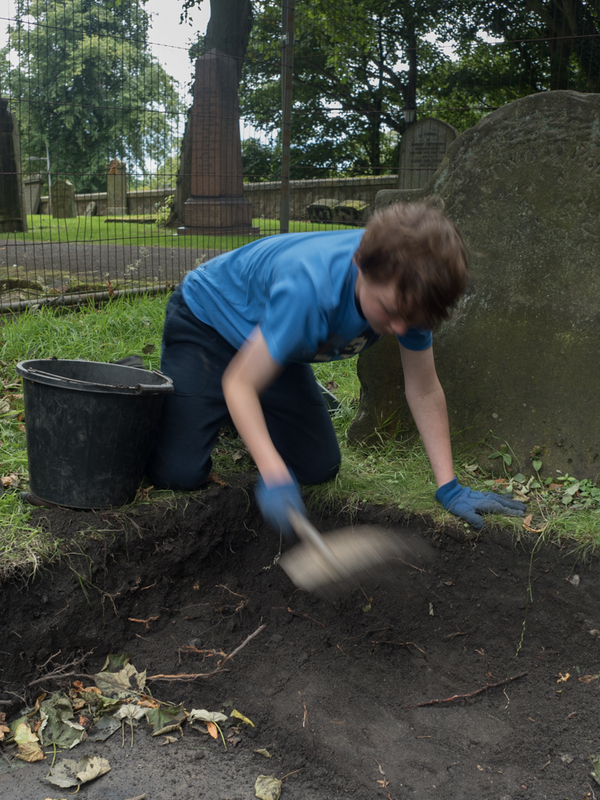 Apart from also working on Saturday’s find, Katy had a go at sieving for missed finds in one of the spoil heaps, Alexander and Mhairi helped out in the DHCP trench and everyone spent time cleaning up inscriptions with brushes and toothpicks. It was a long day and the blustery conditions made life difficult, especially when trowelling or shovelling into the wind, but we had fun and the results speak for themselves. 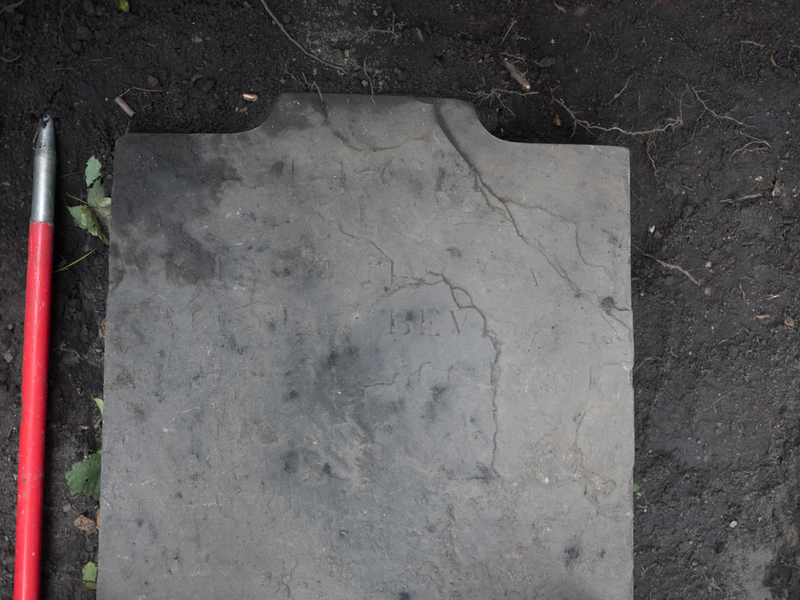 The flat stone we found on Sunday. 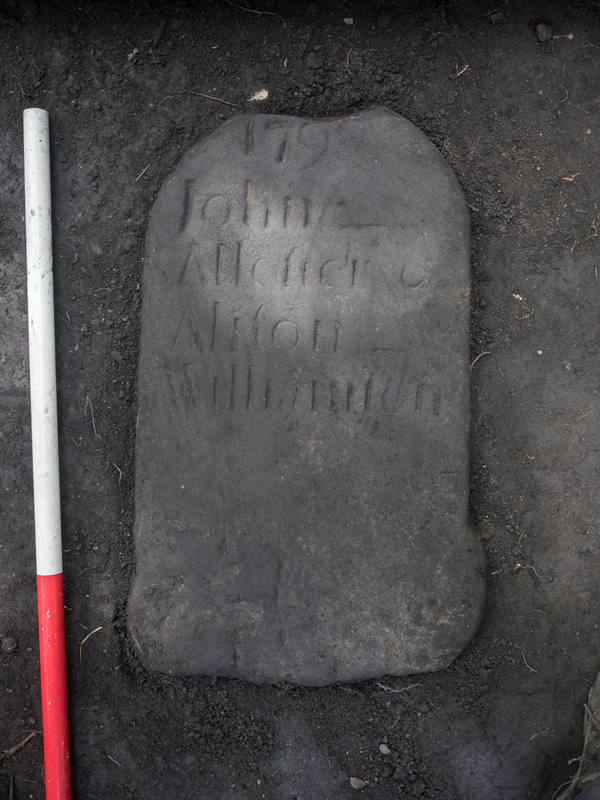 A quick clean-up did not make us hopeful of finding any inscription. We were joined by two YAC members today: Kathryn and Lee, and I have to say that they got a lot of work done between them. 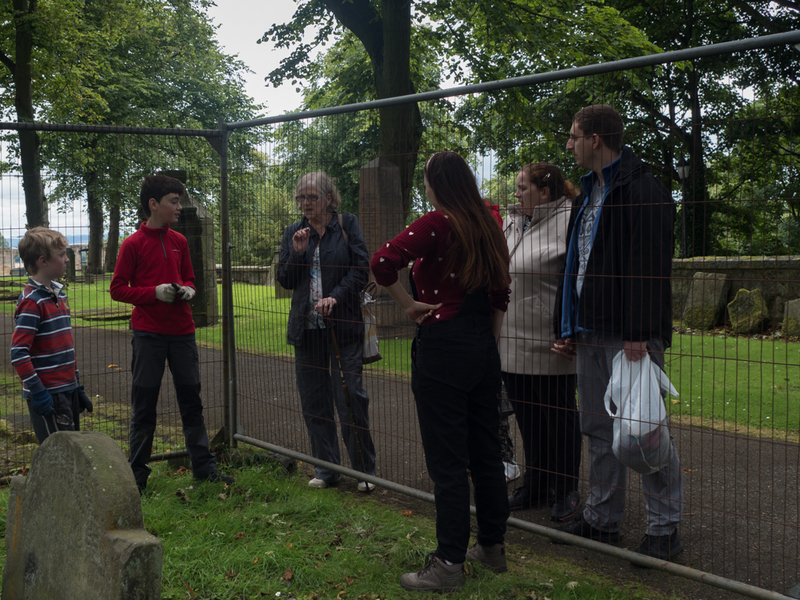 There were lots of visitors today, wanting to know what we were up to in the graveyard, so Kathryn and Lee were left to do most of the work. Which is as it should be. 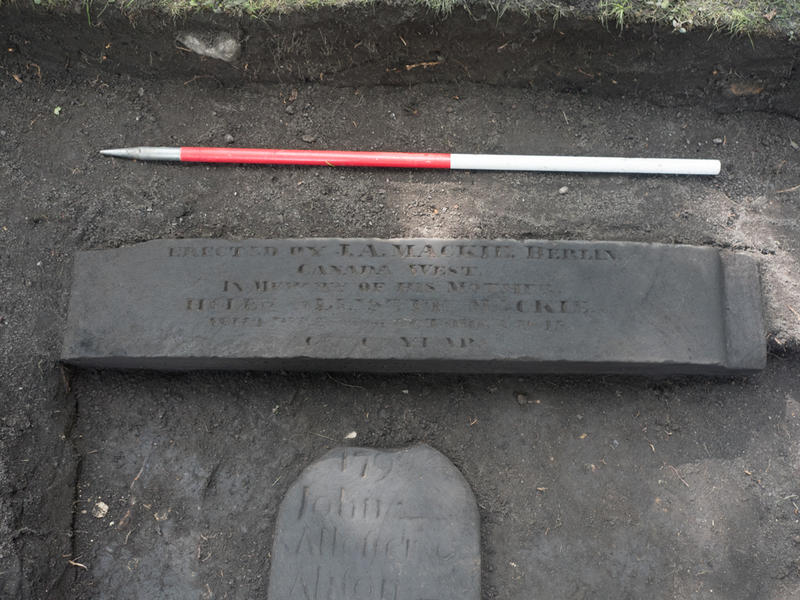 Last time we discovered a small headstone with inscription, the top of which disappeared into the west side of the trench. So, first job today was to extend the trench enough to reveal the rest of the stone. Almost immediately we noticed another stone coming out of the new edge of the trench, which had to be extended once more. Just as well we all love deturfing so much! 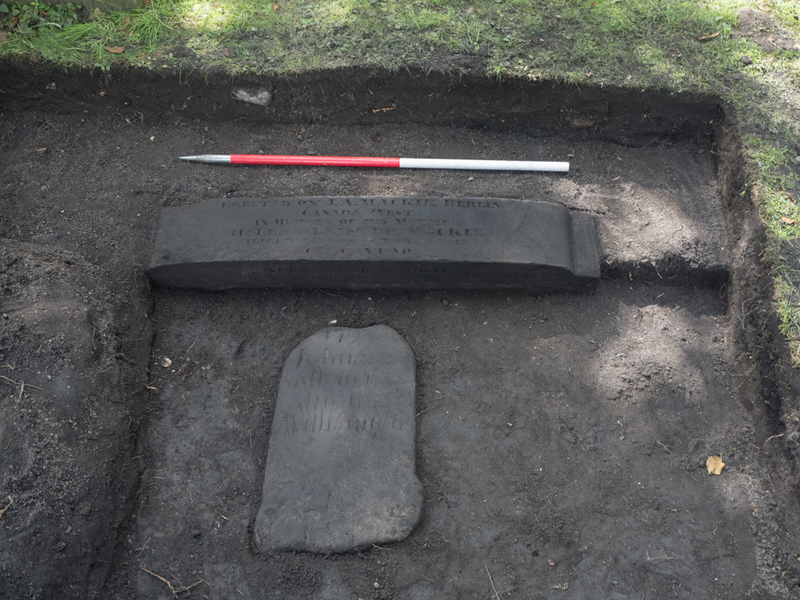 We spent pretty much the whole day uncovering the new stone, which judging by style and well preserved inscriptions, is definitely 19th century. As usual, we found lots of broken glass and some rather nice , though smashed, china. Below you can see the results of our labours. Already the inscriptions are becoming legible and we shall clean them properly next time. The 19th century stone has an inscription on the top. Note that the first name mentioned is that of the son, just to make clear what a generous and caring child he is, despite now living in Canada.